Ran Duan is a visiting assistant professor at the Reynolds School of Journalism at the University of Nevada, Reno. Her research interests span the areas of environmental, science and visual communication. Her current work particularly focuses on the use of animation in environmental news, visual communication of natural disasters, risk perception and the implications of these areas for public policy and journalism practice. She is also presently collaborating with the Society of Environmental Journalists in conducting a study on environmental journalists’ knowledge competency. Duan has been published in leading peer-reviewed journals such as Climatic Change, Environmental Communication, Environment and Behavior, Human Ecology Review, Social Science Quarterly and International Communication Gazette. Her research has been supported by national and local funding agencies such as the National Geographic Society, Michigan State University’s Environmental Science and Policy Program and University of Nevada Reno’s Center for Advanced Media Studies. She holds a Ph.D. in media & information, a doctoral specialization in environmental science and policy and a master’s degree in journalism from Michigan State University. Her bachelor’s degree in journalism and mass communication is from Shandong University, China. 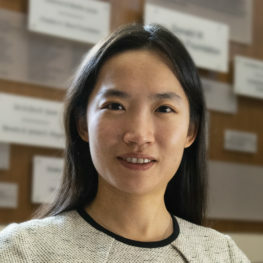 Before beginning her academic career, she was a reporter for China Central Television (News Channel) where she covered transportation and environmental issues. In 2011, she worked as a volunteer to give lectures and workshops on environmental protection in elementary schools in Accra, Ghana. Visit Duan’s Google Scholar profile and website.